It’s a three year old tradition in the Weber household. We gather around the egg nog, hang our stockings with care, turn down the lights, and surf again to our favorite Christmas website: Santa Claus Scaring Little Kids! 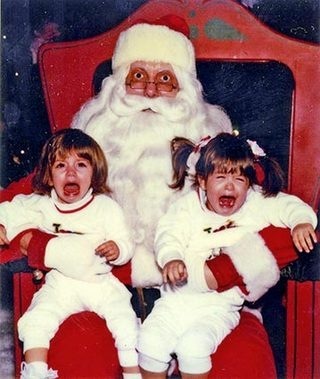 It’s a collection of 150+ pictures of kids who want to be anywhere but on Santa’s lap. “Mommy!, Mommy!” you can hear them crying in terror. The men behind the hot, scratchy beards usually look equally dismayed, hung over, or- occasionally- outright evil. The photographer, wanting to see the line of kids behind her go away so she can finally sit down or go have a cigarette or go home, takes the shot as quickly as possible, with none of the finesse of a Kmart or Olan Mills factory photographer who is usually able to eke out at least a passive look of indifference from most children, who would rather be anywhere else but sitting still in full view of the toy department or food court. 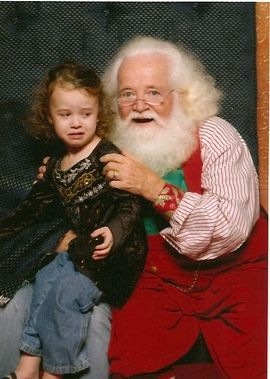 The faux Santa in this picture is a good one. Notice the jocularity and kindness with which he disguises the iron grip of “Sit the hell still!” behind what appears to be gentleness. Notice the practiced skill he employs of wedging the child between his knee and his hand with seeming goodwill. 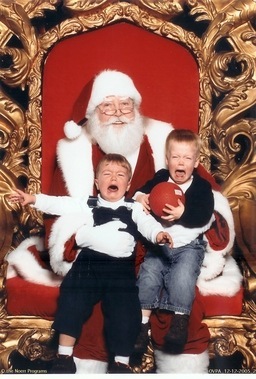 Now this guy gives credence to those who equate Santa with Satan! 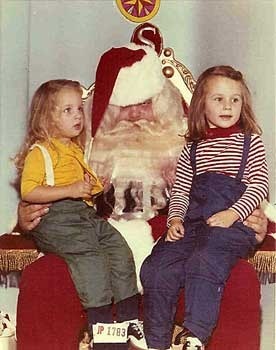 I wouldn’t have allowed my daughters to live in the same town as this guy, let alone get up in his lap. 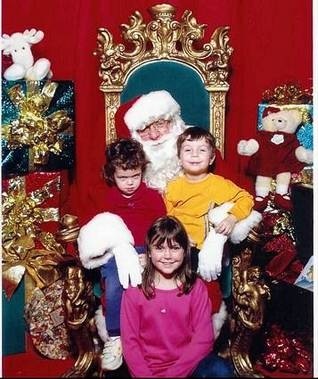 Despite their seemingly calm appearance here, don’t you just know that “something about Santa” would scar their memories of Christmas for years to come? 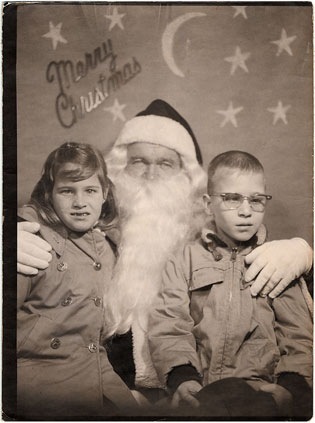 For Billy and Sally, it was a joyous Christmas. For Bobby, it was a door opening into the Dark Side. 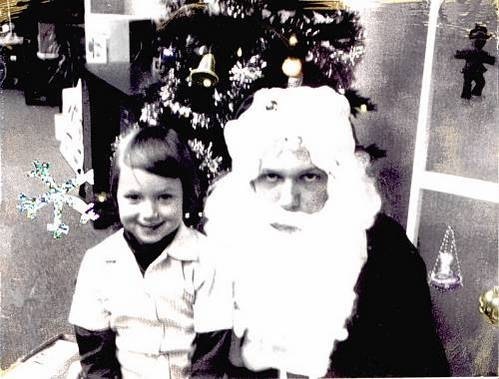 Christmas, 1965. Sister begins a lifetime of sneering hostility toward Mom, men, and everything about the patriarchal, materialistic, sexist, and bourgeois society into which she didn’t ask to be born. Brother becomes catatonic. And, one more. This is the guy who will be in your house on Christmas Eve- the one that the cookies and milk have been prepared for. Pick up some pepper spray on the way home tonight. Everything we know about God has come after an eternity of God’s already being. What we know, is what we talk about, write about, exegete, and argue over. All that was before “In the beginning” and all that we don’t know today and will never know, is the Tao. We could, as we have done with God, try to define, reveal, and expose the Tao, but we would be doing the Tao an injustice- just as we do God an injustice even when we speak of God in exclamatory terms, by what we are unable to say. The Tao will always be more unknown to us than known. Because it is filled, and always filling, with God. But it’s what I haven’t said about all of the above, that is infinitely more important than what I have. You cannot buy happiness. For anyone- not yourself, your spouse, your children, or your boss. You can buy a brief period of satisfaction. How brief? Watch the kids tearing into the next present..and adult attention spans aren’t that much longer. Yeah, that’s all it does. How quickly will Uncle Bill tire of that thing? That thing will be in someone’s yard sale by April. Along with probably 25% of December’s Gross National Product, which is quickly becoming China’s Very Gross National Profit. How many gallons of foreign oil were used in this year’s manufacture of those Bill Clinton saxophone toys? And, how much landfill space will they still be occupying 30,000 years from now when the plastic in them finally begins to break down? Kiva is a micro-lender. You can make loans to small business people in places around the world. Your $25, $50, or $100 is added to similar amounts from other lenders to finance the $500 to $1500 loans being requested. The payback rate is close to 100%, and when your money is paid back, you can either get it back or re-invest in someone else’s business. Some people on my list this year are getting KIVA gift certificates so they can experience the same fun I’ve had giving six women and three men on four continents a real hand up in their lives. The SEVA Foundation is also in the business of fighting poverty and disease through self-help projects. And the array of those projects is fascinating. Last year, my wife received a gift from me, given in her name, which enabled two Mayan women in Mexico to be trained as mid wives. The Heifer Project is an elder statesman in the world of really good places to share your resources. Last year, each of my three children received a flock of ducks, going to Cambodia. Others received from me a flock of chickens, a goat, and some trees. All of these things are given to the recipients with the understanding that they will use the gifts for both food and income, and that they will give away some of the new chicks, kids, and saplings that result from their work. They are gifts that keep on giving for real. Two years ago, I received from friends a llama in Ecuador and part of a community water well in South Africa. I’ve never seen either of those gifts, but they are the ones from that Christmas that I remember best. They are making a continuing difference in the lives of people, as they continue to make a difference in my own. It’s a pretty cool bandwagon. Jump aboard! We’ll meet there at the X where real happiness is always waiting. Jesus taught with parables- little stories that had the potential to bend the mental framework of those who were listening, into shapes of God. He didn’t hammer home the point he was making. He didn’t didactically demand that his disciples conform to his image for them. He simply spoke the story, and trusted the words to find a new home. Say “No” to a child, and she’ll wonder about “Yes.” Build a fence, and watch the other side of it become paradise. Tell a story, and allow imaginations to run free. Does this matter? The Master would answer such a question with silence. Because he knows the answers that are already in us; and he knows it may take some time for us to find them. But when we do (he knows this, too), we will follow him. Flaming Lips- "Do You Realize?" “From where I’m sitting, the sun is setting outside my window. But it’s not setting. Nor is the sun rising elsewhere. The sun isn’t even moving. And that is what The Lips want us to see, that we speak and think in antiquated terms. That the definitions of our world (and ourselves) are still flat conceptually. “Now you’re job is to let your loved ones know that. Only, of course, you can’t, because you don’t know that yourself yet, because it’s the hardest thing you will ever come to know, so hard only the best among us ever figure it out. “And here we see what the song is really trying to do. It’s not trying to tell you that you’re going to be okay because the worst thing that’s going to happen to you in your life is that you will die, and that dying isn’t that bad, because dying is just an illusion caused by the world spinning round. 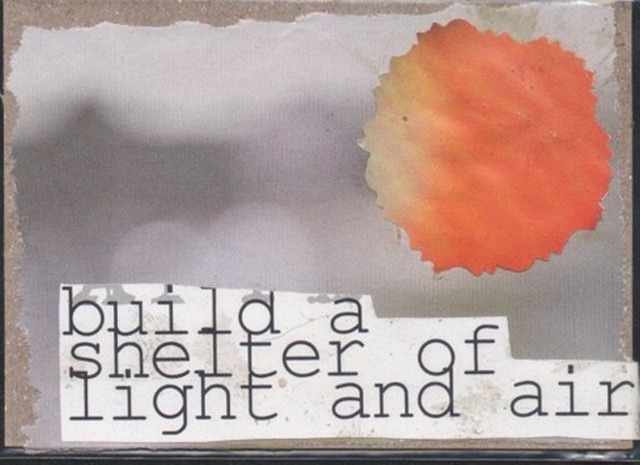 Build a Shelter of Light and Air.. It is fascinating to me because of its Simplicity and Truth. And that Simplicity and Truth is found not only in the images or recollections which the phrase gives rise to in our imaginations or memories; it is the clean nature of the statement itself. Stated in the imperative, it is like a command that has been waiting to be spoken. It is a place which I am perceived to be ready for now- by whom?- and being invited to enter. But first- the imperative- there is work to be done, assembly to be undertaken. The first task, for me, is disassociation from those things- things, stuff, material- that I have allowed to define me and, in the process, bend me. Because that is what stuff does, it bends the shape of the Image of God, the humanity in us, into the shape of whatever shiny baubles attract us. I have learned to feel my way in the dark with my wallet. I breathe in the smog of others’ desires for me to have the satisfaction that only they can sell to me. I am vulnerable and I have been injured, over and over, because I have traded too many times the security I was born with- the security of community with others- for the individual and illusory safety of bank account numbers and one more gadget. I have forgotten so much about sharing. But I have remembered enough to know that holding my hands outward, toward others, is eminently more rewarding than holding them clenched and thrust within my pockets. I want to make room for the Image of God to be growing again, through the presence of others, and not stunted any longer through the weight of all my stuff. So it begins there. The second task is to “let there be light.” Yes, that Light. The Light that comes not from the sun, and certainly not from any incandescent or fluorescent light bulbs; I want more of the Light the ancient rabbis called First Understanding. I want the Light of more Knowledge, yes, but even more than that, I want the Light of Appreciation and Acceptance of what I already do know. I want to spend less and less time criticizing, evaluating, deciding, and then second-guessing, than I do in feeling passionately about and cultivating the facts, ideas, and opinions that are already in me and that I know to be valuable. I want to continue moving from whatever is dark in me, toward that which is Light, and awaits me. And then, to breathe. I want to breathe through walls which separate me from the pulse of the world around me. I want the Air, the lightness of being which surrounds us all, to be the only barrier between myself and others. I do not want to fight for air behind musty walls of tradition, or within stale spaces of ancient standards. I no longer want to gasp for air within the stench of dogmatic death. I want to feel the ruach, the breath of God, always blowing against me, always being drawn into my being. I want to feel led by the Spirit into open spaces, and not pushed by the status quo against the brick walls of fear built by others. I want to build a structure of Light and Air with others, for others, because of others, and live there, too. That is the only structure, a structure of Understanding and Freedom, that will withstand the onslaught of those who live, instead, in forts, ready to fight and die for the beliefs they cherish and store within dark, thick, impermeable walls. It is the Structure of Light and of Air in which I will live and toward which I am moving. I beg you to come along. We will need each other, to help each other disassemble, unpack, and even tear down some of what we thought, by ourselves, was precious. We will need each other to remind the other that the Light is sometimes uncomfortable but always illuminating, and that the Air is often harsh and cold, even as it is life-giving and clean. We will build a structure of Light and of Air and we will say, “Welcome” to all who come nearby.